With is full, free and open data access policy, Copernicus is the biggest and the most ambitious Earth Observation (EO) programme in the world. 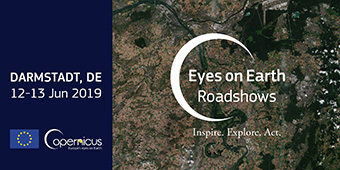 Besides all its well documented economic and societal benefits, Copernicus can also be used as a tool to make younger generations aware of the many issues linked to environmental and climatic challenges facing our planet. It can also motivate to embrace careers in Earth Observation-related jobs. Many of our readers are parents, grandparents and are asked or could propose to present Copernicus in classrooms. But even for those of us that are experts in one or more aspects of Copernicus, finding the right tools, if not the right words, can be challenging. Copernicus Observer therefore decided to provide its readers with a few tips on how to “talk Copernicus” in the classroom. Copernicus provides various ways you can access the data directly and use it. For the experienced Earth Observation data users, we suggest using direct access via Access Hubs. But if you’re new to this topic and just want to browse various options and ways to use Copernicus data, you can check out our Data and Information Access Systems (DIAS). The five Copernicus DIAS platforms provide cloud-based tools for manipulating data without downloading it. Some DIAS have special offers for educational purposes (note that basic offers that include Copernicus data access are free, but additional value-added services from a DIAS platform may cost). If raw data is not what you’re looking for then you can look into what Copernicus Services have to offer. They provide “crunched” processed data transformed into information for different sectors. In the list below, we’ll show examples of only one of many products that these Services provide and that can be used in a classroom. Air pollution is a huge problem worldwide, especially in urban areas. Copernicus Atmosphere Monitoring Service provides daily air quality forecasts and analyses. You can access them via the CAMS website, find your location via European Environmental Agency’s online Air Quality Index tool or take a look at Euronews Daily Air Quality forecast to learn what is the quality of the air you are berating today in your city. Our oceans are an essential part of our planet’s life. 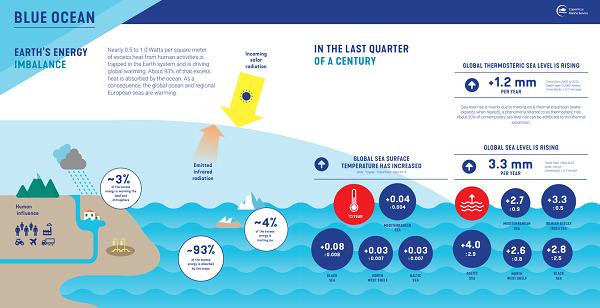 Today, oceans and seas are rapidly changing due to climate change, and as they are warming, it affects everything else – from sea life to shipping routes, to coastal life. The Copernicus Marine Environment Monitoring Service (CMEMS) monitors our oceans and one of the largest contributions to scientific understanding is the “Ocean State Report” written with contributions from over 100 scientists and providing a summary of the state of our oceans today. The report and its summary are written in an easy-to-understand manner and has lots of visual information that can be presented in a class. The report can be freely accessed or downloaded online and to use for educational purposes. Additionally, the CMEMS website gives access to many interesting products. You can easily check the ocean temperature reports and forecasts or see how wave or currents intensity varies. Furthermore, the Service has a dedicated webpage aimed at informing users about education opportunities. 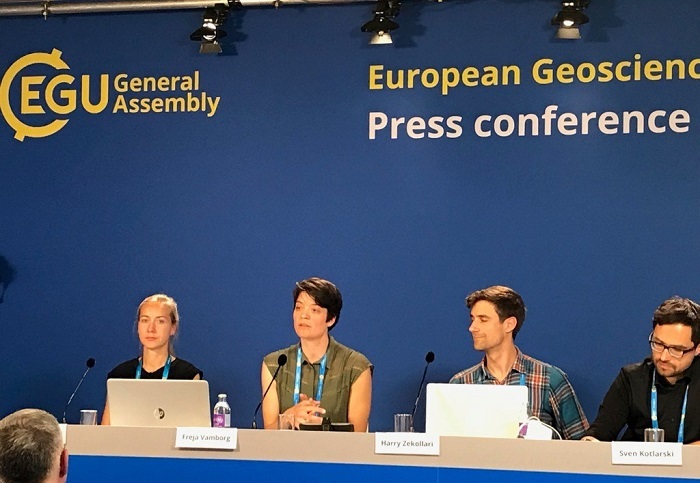 The Copernicus Land Monitoring Service provides reliable and consistent information on the European and Global land environment. This allows users to track land cover and land use changes as well as vegetation and crop conditions at different levels. 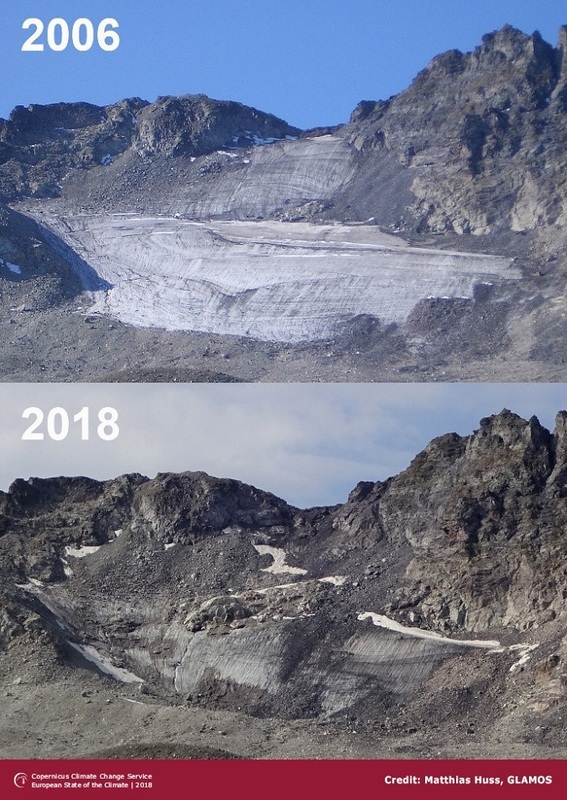 It is possible to investigate the impacts of these changes and seasonal evolution on other aspects of the environment such as the availability and sustainability of energy and natural resources. For example, you can have a look at weekly and monthly vegetation evolution and anomalies for your country in the Global Land Viewer. Climate change is widely discussed around the world. For an informed debate on this topic, accurate information is necessary, and this is where the Copernicus Climate Change Service comes in. Among other things, this service provides Monthly Climate Bulletins that can serve as a quick overview of how Earth’s climate evolved on any particular month compared to the reference period of 1981-2010. A quick monthly summary is also available on Euronews that is receiving this data from Copernicus. The Copernicus Emergency Management Service supports emergency managers around the world after disasters such as floods, hurricanes, forest fires and earthquakes. The Service provides maps and geospatial data that show the effects of the disaster as seen from space. But that’s not all – the Copernicus EMS also monitors forest fires, floods and droughts and gives early warnings to the local authorities on a disaster about to happen. Want to see if there are forest fires happening in your region right now? Check out EFFIS Current Situation Viewer, enter your country, click on the “active fires” boxes and look for the red dots – they represent a fire that has passed in the last 24 hours. The sixth Copernicus Service aims at ensuring security of EU citizens, safety at EU borders, preventing loss of life or pollution at sea, fighting cross-border crime, or supporting peace-keeping operations and monitoring areas of interest to the EU abroad. As information products from the Copernicus Security Service is sensitive, it is reserved to so-called authorised users. You can get a glimpse at the benefits of this Service here. Throughout the years, Copernicus has published many other materials – images, factsheets, processed satellite imagery, use cases that can also be used after crediting Copernicus. Copernicus factsheets & brochures can be freely downloaded and printed for use. Copernicus imagery can be freely used as long as the Copernicus programme is credited. Copernicus video. If you need a boost before you dive into the data access and services, you can watch the video training series that provide an overview and concrete examples for using Copernicus data and information. These can also be freely used for educational purposes and are aimed at students who would be using data. At first glance, Copernicus can seem to be too scientific and it is true that a lot of Copernicus data is used by scientists, researchers and other professionals. However, this should not discourage you from using it at any level of education. There are simple tools that could help you bring Copernicus to the classroom. Sentinel Hub. The Sentinel Playground browser application provides an intuitive and simple way to browse Copernicus Sentinel-2 imagery – just type in any location in the search window and you will see the latest image of the location. You can also play around (thus the Playground) with different types of Sentinel-2 band combinations, e.g. Vegetation Index, Moisture Index, etc., that display different ways in which the Copernicus Sentinel satellite “see” the world which can provide various types of valuable information. SnapPlanet. Another great app that demonstrates how beautiful (and fragile) the world we live in is. 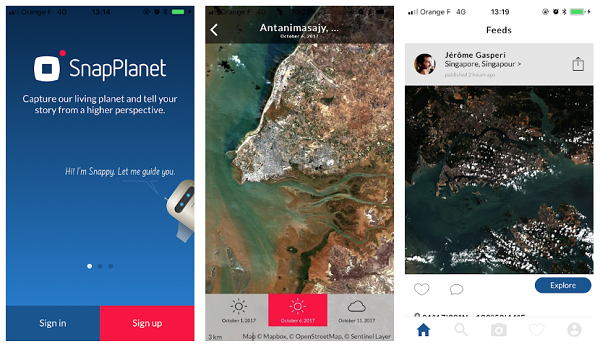 SnapPlanet is a user-friendly tool to browse or create beautiful Sentinel-2 images from a smartphone or tablet. The application also offers different functionalities such as comparison of images to detect changes, creating time lapses to demonstrate how the Earth is changing or a direct social media sharing function to keep the number of your followers growing. Spectator. This application also offers various easy-to-use image processing functionalities, but it is unique as it includes a convenient tool that allows tracking past or future Sentinel-2 satellite image acquisitions. Earth Nullschool. This browser application visualises information such as weather, wind and ocean currents on a beautifully rendered Earth. Copernicus data in this app show how Particulate Matter (PM 2.5 and PM10), which influence air quality, move across the globe. Copernicus Sentinel app. Track our Sentinel satellites as they orbit the Earth. 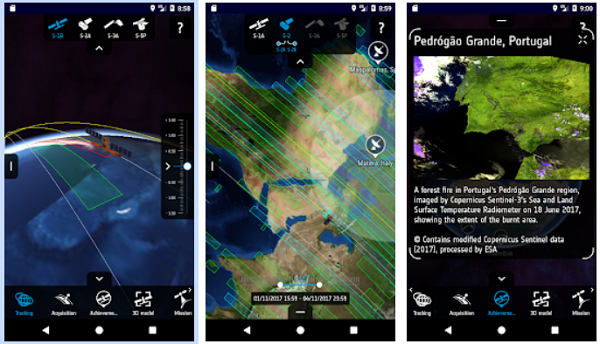 This mobile application (for Android and iOS) you can track the satellites in real-time, get notifications when they are flying by, and learn more about each of the Sentinel and their products. It is free to download and use. Resource Watch. How does air pollution look from space? Resource Watch has developed an online tool that allows you to see air pollution caused by different gasses (e.g. NO2 and O3 – they also describe each pollutant, its origins and effects on human health) over the last 30 days. These are just a few examples of how Copernicus can be used for open education. Currently, Copernicus Academy members are developing material for Copernicus usage in schools and universities – this will also be freely available for educators around the world. Follow the Copernicus website and social media channels (Twitter, Instagram, Facebook) to learn more.